Is the Midlife Crisis Having a Midlife Crisis? For over 40 years midlife has been hailed as a time, especially for men, when anxiety over life’s lost opportunities and our impending death hits a max. This anxiety can result in radical life change and tumult like divorce, expensive red convertibles, and career changes: the dreaded midlife crisis. 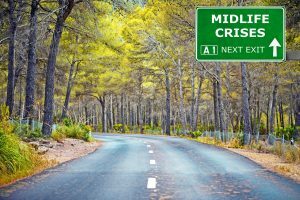 Most men growing up in America in the 60’s, 70’s, and 80’s were led to believe that a midlife crisis was the inevitable and unavoidable initiatory right of passage into midlife. Many a movie and book has explored the extremes and subtleties of midlife transitions. But is crisis really a requirement? And if not, what’s really going on? Elliot Jaques, a Canadian psychoanalyst, is credited for the “discovery” (okay, rather inception) of the midlife crisis in the mid 1960s. Jaques theoried that at about the age of 35, men begin to see that their youthful dreams will probably never be realized. Jaques’ theory was based largely on a historical review of world “geniuses” mixed with some experiences gleaned from his own clients. Then, in the late 70’s, Jaques’ ideas were further developed by Daniel Levinson in his book The Season’s of a Man’s Life. Levinson built on Jaques’ midlife concept and concluded that 80% of men have a midlife crisis between the ages of 40 and 45. Wow! Now those are some “good” odds! NOT! Levinson would identify this period as the Mid-life Transition, a cross-era shift between early and middle adulthood. This period was typically marked by a “de-illusionment”, a grieving of the loss of possibilities, which acts as a catalyst for the midlife crisis. What Levinson accomplished within the halls of academia, Gail Sheehy brought to the well of the cultural mainstream in her seminal book, Passages. Within her book Sheehy defines the predictable crises of adult life, including the “Age 40 Crucible.” This crucible is where dissatisfaction and unrest make for dramatic upheaval in midlife. The primary challenge with these works, all of which ostensibly created the phenomena of the midlife crisis, is that they were done using research designs that are by today’s standards not considered good science. Levinson’s work was based on interviews of only 40 middle-class men in midlife, an extremely small sample size. And Sheehy reached her conclusions by supplementing Levinson’s work with interviews of folks that she selected. Neither used a rigorous research method to arrive at their conclusions. In fact, when subsequent researchers have tried to replicate Levinson and Sheehy’s findings, no conclusive confirmation of the existence of a midlife crisis could be found. Adults are no more prone to leaving their jobs and spouses in their 40s as they are at any other age. Research conducted since the 70’s has found that a midlife crisis is only likely for about 10 percent of males in the U.S.
Oh my gosh, so why the hell have I created a website devoted to men in midlife?! I think I’m having a Men-in-Midlife crisis! While your chances of having a midlife crisis are in actuality much lower than originally estimated by Levinson, the research is clear that there is something going on at midlife. What’s really going on in midlife? In her 2016 book, Life Reimagined, Barbara Bradley Hagerty does a great job of getting to the “bottom” of this midlife crisis dilemma, literally. She explores the research that has found that in our 40s and 50s we reach the bottom of the U-shaped curve of happiness. In conversation with researchers whose studies spanned over 72 countries and included more than 350,000 Americans, Hagerty shines the light on the existence of a midlife malaise common across the globe. A future post will explore the U-curve in more detail and share ways to successfully make the midlife transition. We’ll look at ways of creating a more meaningful life so that we can minimize our time at the bottom of the curve and begin the climb up. What’s your experience of midlife and where are you on that U-shaped curve? I’d love to hear from you in the comments below!